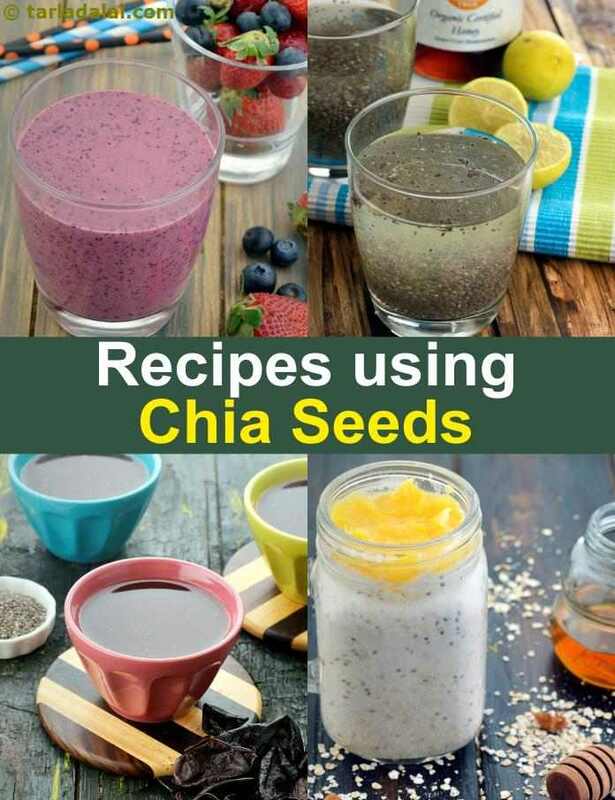 chia seed recipe collection. chia seed Indian recipes. Chia means strength and is a super vegetarian food. It is a very small black and white seed and easily available in India. The best way to have Chia seeds is to toss it into a healthy juice or healthy smoothie. The effect it has that it tends to thicken the juice or smoothie. Just stire and enjoy it. They are a rich Antioxidant whih helps in energy production. Being rich in Fibre they tend to keep you fuller for a longer time. Even better, they are a great source of Omega 3 Fatty Acids which is crucial for Vegetarians. In fact, i would say that you should have them daily. Chia Seeds to make healthy Indian bread. Looking for a totally healthy bread which is healthier than whole wheat bread. Jowar Rajgira bread with chia seeds is a super gluten free bread which you can easily make at home. The easiet way is to make a Chia Seed drink with honey and lime or toss it into a juice. A lovely Indian drink to try is Kokum Chia seeds drink. For smooothie lovers post workout have the energizing smoothie made of spinach, avocado and chia seeds. If you are a lover of Oatmeal then try Oatmeal Almond Milk Apple recipe which has 1 tsp of Chia and what is probalby enough for the day. Another gluten free option is Oatmeal Almond Milk with oranges is a great way to start your day. Who should have Chia Seeds? Everyone. We are serious about this. Want to stay fit and energetic, then have 1 tsp a day. Its so easy. If you are Vegetarian, then 100% have it. It is the second highest source of Omega 3 Fatty Acids which come from ALA. If you are an Athlete, then your endurance will boost from this. Enjoy our chia seeds Indian recipes below. Include them in your diet daily.